A small, isolated dark nebula known as a Bok globule was described as “a drop of ink on the luminous sky” by its discoverer, astronomer Edward Emerson Barnard. Through a small telescope, the object seen here, Barnard 86, does appear as though someone may have dropped a blob of dark ink on the telescope lens. Or perhaps it appears as a spot where there are no stars, or a window into a patch of distant, clearer sky. However, this object is actually in the foreground of the star field — a cold, dark, dense cloud made up of small dust grains that block starlight and make the region appear opaque. It is thought to have formed from the remnants of a molecular cloud that collapsed to form the nearby star cluster NGC 6520, seen just to the left of Barnard 86 in this image. 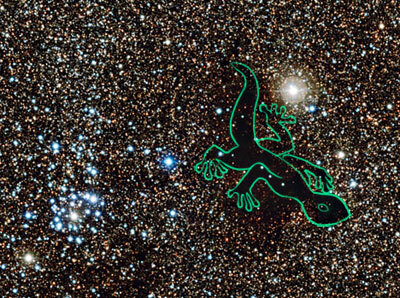 Some say Barnard 86 looks like a gecko … can you see the resemblance? This image was taken with the Wide Field Imager on the MPG/ESO 2.2-meter telescope at ESO’s La Silla Observatory in Chile. This cosmic pair is set against millions of glowing stars from the brightest part of the Milky Way — a region so dense with stars that barely any dark sky is seen across the picture. It is located in the constellation of Sagittarius in one of the richest star fields in the whole sky, the Large Sagittarius Star Cloud. The huge number of stars that light up this region dramatically emphasize the blackness of dark clouds like Barnard 86. For more info on this image, see this ESO page.